Greece is a country known for its beaches. 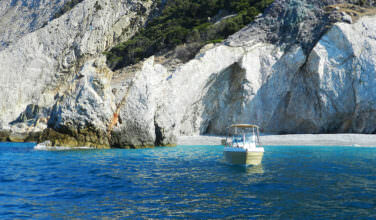 Not only are Greek beaches popular among tourists from around the world, many are award winning seashores. Over 400 of Greece’s beaches were awarded the Blue Flag award by the non-profit organization the Foundation for Environmental Education (FEE). The FEE, a Copenhagen-based international organization, ranks beaches based on a variety of criteria including water quality, litter management, environmental protection, and safety procedures. Greece’s beaches have stood out in these categories, awarding 408 beaches and 10 marinas in Greece the status of a “Blue Flag” beach. In the cozy seaport town of Agios Nikolaos on the island of Crete, you will find four of these 400-plus Blue Flag Beaches. All of these beaches are located right within the town, so feel free to visit every single one of these beaches in Agios Nikolaos during your stay. 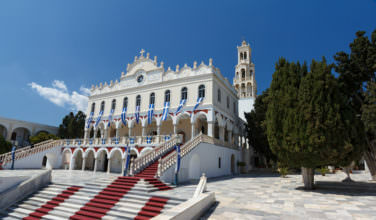 Named Kitroplatia, which in English means Citron Square as the Citron fruit was cultivated in Agios Nikolaos. In fact Kitroplatia beach used to host a Citron marketplace. Kitroplatia beach is a popular beach as it is only minutes from the town center of Agios Nikolaos. The beach is located in front of a small stone-paved square, which hosts many taverns that offer views of the water. Just beyond the square you’ll find a booth for umbrella and lounge rentals and showers, which then give way to the sandy shoreline. Like Kitroplatia, Ammos beach is just minutes from the town center and also has lounge and umbrella rentals for visitors. Located a little past Kitroplatia on the south side of Agios Nikolaos, Ammos beach is a great beach in the center of town, which is near the major shopping area in town. Ammos translated to English means sand as the shore is covered in pristine, smooth sand. There are plenty of restaurants surrounding the beach and hotels if you are looking for a central location in town that offers beach views. Head just one kilometer north of the city center and you’ll find Ammoudi beach. The beach is located in a large, well-protected bay. It has a small sandy beach and clear waters making it a favorite among locals and tourists alike. Thanks to its location in the bay and the fact that large Tamarisk trees surround it, the beach is sheltered from the strong north winds. The beach also has a water sports facility. However, it is important to note that due to its ideal location and smaller size, this beach often gets crowded rather quickly. 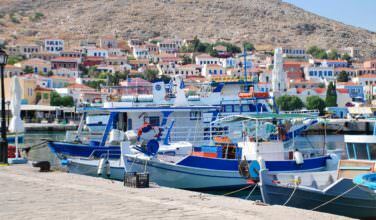 While this beach doesn’t sound like it is the most glamorous seaside destination thanks to its long, rather clinical name, the Municipal Beach of the Greek National Tourism Organization (commonly referred to as EOT), the beach is well worth a visit. Unlike most beaches in the area, EOT is a pebble beach. However, there are large lawns of grass just above the shoreline that are well maintained and offer plenty of places to lounge and enjoy the sun. The trees nearby offer shade for hot days, and there is a mini-golf course should you bore with the traditional beach activities of sunning and swimming.